Time for another new recipe. One of my favorite English beers readily available in the USA is Old Speckled Hen, an ale that falls somewhere in the English Pale Ale / Extra Special Bitter style. A quick internet search turned up this recipe at BIABrewer.info (also available on the BeerSmith recipe cloud). 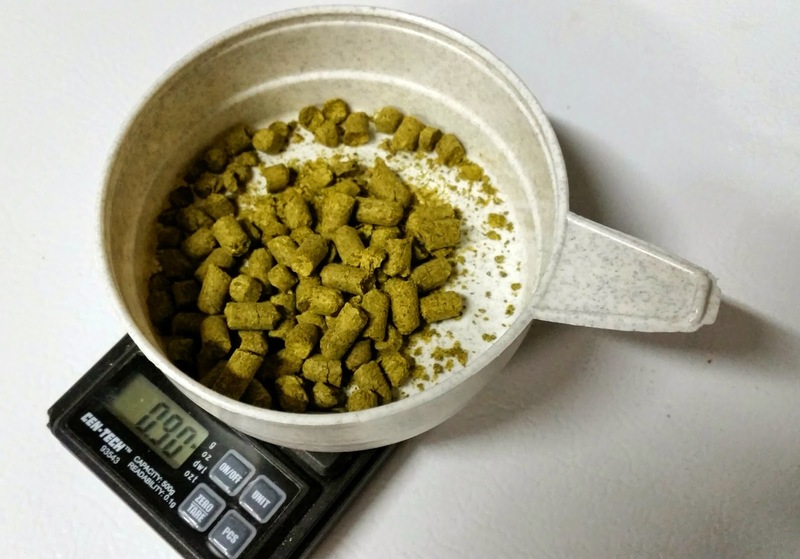 BIABrewer user hashie posted the recipe, so it has their name at the helm. The original recipe was developed for the brew-in-a-bag technique, so I had to modify the grain bill slightly for my own batch sparge setup. I mashed in with 3 gallons of water at 164°, hitting 151.4° for the mash start. The mash temperature was at 148.5° after 35 minutes and 146° after 60 minutes. I added 1.3 gallons of water at 180°, which raised the mash bed to 151°. I let this sit for 10 minutes, vorlaufed, and collected 2.75 gallons of wort. Next, I added 3.25 gallons of water at 185°, which raised the mash bed temperature to 168°. I let this sit for 10 minutes, vorlaufed, and collected the rest of the wort. In total, I collected 6.2 gallons of wort with a gravity of 1.043. This works out to ~69% efficiency. It’s a little less than my best brews (~75%), so I wonder if that’s because I didn’t use 5.2 pH stabilizer on this batch. I brought the wort to a boil and added the Northern Brewer hops. After 45 minutes, I added the first dose of Goldings. After 50 minutes, I added the Irish moss. After 55 minutes, I added the second dose of Goldings and the golden syrup. The syrup has a really nice toffee note to it–I am interested to see how that will translate into the overall beer. After 60 minutes, I turned off the flame and chilled the wort down to ~78°. I transferred ~4.9 gallons of wort into the fermenter, with a starting gravity of 1.055. After pitching the yeast, I sealed everything up and put it in the fermentation chamber. Temperature is set for 66°. This entry was posted in clone, ESB, pale ale and tagged Old Speckled Hen. Bookmark the permalink.